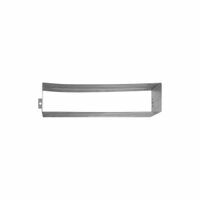 National Hardware Mail Slot Sleeve, Series: V1911S, Suitable For Use With: National NO 1911 Mail Slot on Hollow Core Doors, 2 in, Steel, Stainless, 2.62 in Width National Hardware Mail Slot Sleeves, Suitable For Use With: 1911 Mail Slot On Hollow-Core Doors, 1-1/2 in, Stainless Steel, Corrosion Resistance Flap and back plate included. 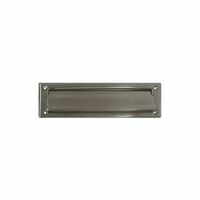 Size: 10"W.
Flap and hood plate.13"W x 3"H. Spring loaded front plate, standard back plate. Opening: 11"W x 2"H. Weather-Tite construction featuring interlocking flap and frame. Spring loaded front plate, insures tightly closed position. Overall size: 13" W x 3-9/16"H. Spring loaded front plate, standard back plate. Opening: 11"W x 2"H. Weather-Tite construction featuring interlocking flap and frame. Spring loaded front plate, insures tightly closed position. Overall size: 13" W x 3-9/16"H.